The CNA salary in Delaware is one of the first things that individuals seeking these jobs consider before undergoing training and certification. Despite Delaware not having a high cost of living, its salary wage is highly attractive to many wanting a start in the health care field. Nursing assistants work as members of a health care team at a medical facility and are in demand to meet the growing need for health care services. Workers in this occupation render services to various clients under the supervision of licensed practical nurses or registered nurses. 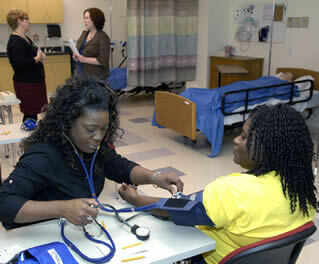 In Delaware, certified nursing assistants can begin earning an annual pay rate of $24,460. The more you gain experience and stay longer with the employer, the greater the chances that your hourly pay or salary wage can increase. The average salary wage of CNAs for each year is about $29,701. With several years of experience in the job, having increased wages already, one can have the potential to earn as much as $34,943 every year. Those who put in extra overtime can earn additional money over and above the standard work week. Experience – CNAs with more experience earn higher rates compared to entry-level CNAs. Job Location – the salary wage is based on the location from where you are working. The amount of money that you will received from work is in accordance to the cost of living of the work location. Employer – private companies running a nursing facility may offer lesser pay compared to nursing facilities that are run by the government. Most of the individuals seek in hospitals because of the high pay rate being offered. Aside from the salary wage that certified nursing assistants are attracted to, their motivation can also be enhanced by providing them with benefits that they can take advantage of. If you want to get started working you will need your certification license. A license can be acquired by attending 150 hours of CNA classes in Delaware, and passing the state exams which require taking a physical skills exam & written exam.